I always like to have a homemade sweet treat in the pantry to have with a cup of tea after dinner. Today I made jumbles. How many times have my hands been coated in this sticky mix of crushed biscuits, cocoa, condensed milk and coconut? How many times have my mother’s? 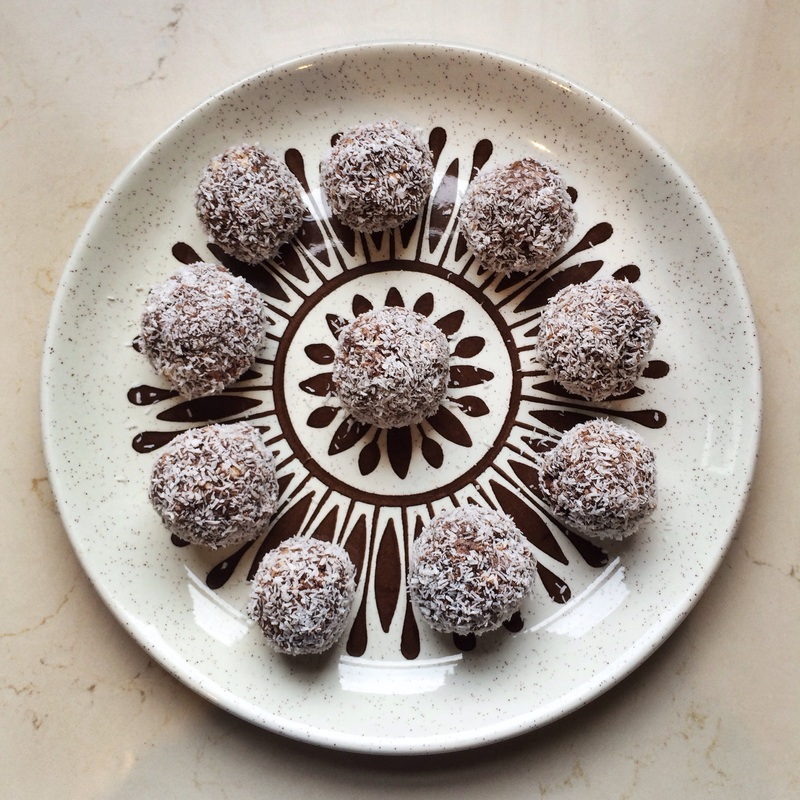 As I stood forming my little spheres, rolling them in coconut, I could see my ten year old self watching my mum, on Saturday afternoons, laying out a towel on our white laminex bench (‘easier for cleaning up’) and setting out the ingredients for the coming week’s sweet goodness. After we’d eaten our cooked lunch (‘Dad eats sandwiches all week. It’s important he has something different on the weekend’), and Dad had changed into his gardening clothes (are you getting a picture of my family?! ), the Sunbeam mixmaster would whir away, whilst the football would be on the wireless in the background, and the ‘shoosh’ of Dad’s hand mower cutting the lawn would drift from outside into the kitchen. There was always a cake and either a slice or batch of biscuits. Jumbles were a favourite, as were cherry ripe slice, mars bar slice and chocolate cheesecake slice, which in our now, more sophisticated times, has been renamed ‘cheesecake brownie’! The Women’s Weekly cookbooks were well used in our home! If Mum worked quickly, there might be something ready to have warm from the oven for afternoon tea (quarter past three, all four of us around the table!) But, regardless, each day in my lunch box, there would be a little waxed paper parcel encasing her homemade love to savour with the lime cordial in my drink bottle. After our dinner tonight, my girl was left exclaiming ‘where’s my jumble?’, my man having gobbled down both his and hers from the plate on the coffee table. It’s a family favourite that endures. I hope she will make them for her family and my boy will make them for his. I love that what we make for our families feeds not only their bellies but also their memories and nourishes them with our love. Do you have baking memories from your childhood? Do you still bake the daggy old family favourites? Was your family as traditional as mine?! Next > One + Four = Life: routine begone! Thanks Rebecca! I wish I could make scones but, alas, I have no luck! My attempts have a scone flavour but they are not light and fluffy. My nanna was a bit of a wiz at whipping up a scone. Just had the light touch! Thanks Isabel! I’ve seen those jelly cakes in a Women’s Weekly book! My Nanna used to make coconut macaroons with a glacé cherry on top – I’m not much of a fan of the glacé cherry… My mum found her eating through a jar of them one day – said she was having her fruit for the day! When we were having our kitchen redone my mum baked us sweet treats. Gotta love a baking mum! Mmmm yum 😀 We call them coconut balls! Not very original, haha. But they’re so good, and pretty quick to make. I loved your post Carolyn 🙂 We always did and always will have treats at home, biscuits, cake or left over dessert. And sometimes all three at once! And how good is Mars Bar Slice! 4 ingredients… Mars Bars, butter, chocolate rice bubbles. So good! I think coconut balls is quite a sensible name! Don’t know where ‘jumbles’ came from! I do love those quick and easy old recipes. Mum also used yo make yo-yos (melting moments) but you have to roll the biscuits AND do the icing to sandwich them together – too much of a hassle for me! Perhaps our next get-together should be bring a plate of old-fashioned goodness! Oh my gosh yes! We definitely should do a bring a plate 🙂 Mum makes yo-yos too! Now I want tea and cake, haha. I made lemon slice today. Sending you a virtual piece to have with tea!